Steingraeber & Söhne will be present at this year’s international craft fair from 13.-17. March 2019 at the Munich Trade Fair. 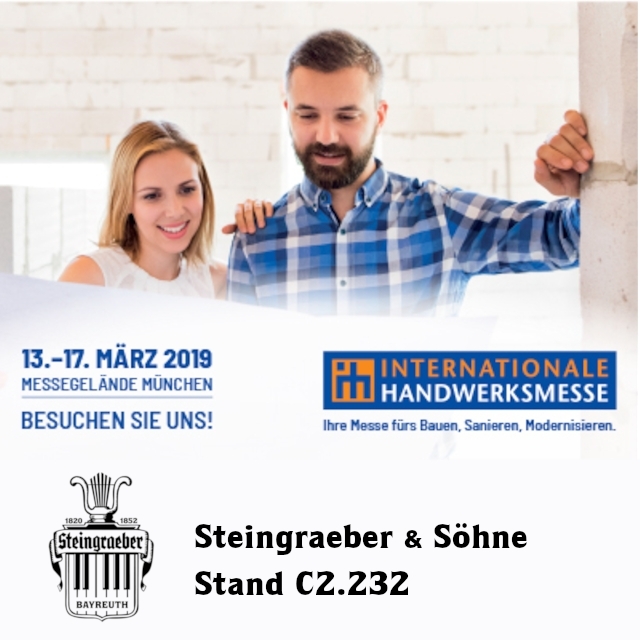 At stand C2.232, among others, a Steiningraeber Transducer Grand Piano will be presented, for which Steingraeber was awarded the Future Prize 2018 by the Handwerkskammer (HWK) for Upper Franconia. Steingraeber & Söhne convinced with the concept of “Transducer in the soundboard” which can produce “disturbingly authentic” grand piano sound and thus can become a musical enrichment. We look forward to your visit at stand C2.232!